With the latest technologies in “smart homes” or “intelligent homes” (sometimes called “The Internet of Things”) – your window treatments can open & close automatically, adjusting for the perfect balance of light and privacy – morning, noon and night! Depending upon the system you choose, your blinds and shades can even integrate with your thermostat to open or close your shades as the temperature in the room rises or drops. You can also coordinate your shades or blind with your lighting – to turn on lights and when you close the shades, or turn off lights when you open them! 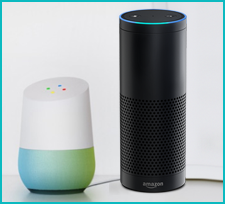 And, of course, you can also control your window shades and blinds with voice commands using your Amazon Echo (Alexa) Google Home Assistant, or other voice compatible system. To begin with, you will need motorized blinds and/or shades that have the capability to “interact” or “communicate” with your Smart Home System. We recommend Hunter Douglas PowerView® Motorization, because it communicates with every major Smart Home System including Nest, Amazon Echo (Alexa), Google Home and more. Finally, you need to integrate your compatible Smart Home System – so that it “communicates” with your motorization system through your Powerview® Hub. Note that some of these systems integrate more seamlessly than others with Hunter Douglas PowerView® motorized blinds and shades. While “Nest” is virtually “plug and go,” others systems may require you to download certain drivers. Another reason we recommend Hunter Douglas PowerView® motorized blinds and shades for smart Home use is the excellent online documentation and technical support they offer our customers when setting up their PowerView® Hub to work with compatible Smart Home systems. We are a licensed Hunter Douglas dealer and can design and install custom PowerView® motorized blinds and shades in your Calabasas, Malibu, Agoura, Westlake Village or Ventura County home. If you are ready to take your home to the next level – with Intelligent Home motorized blinds and shades – call our experts today.